On Saturday morning I went round to visit Des and Lorraine’s junk shop in Bacon St – sandwiched between a second-hand catering equipment dealer and a tattoo parlour, you might not even notice the discreet entrance if you did not know it. Although I had admired the crow painted upon the double doors by the street artist Roa, I was unaware of the wonders that are contained behind this unassuming frontage. 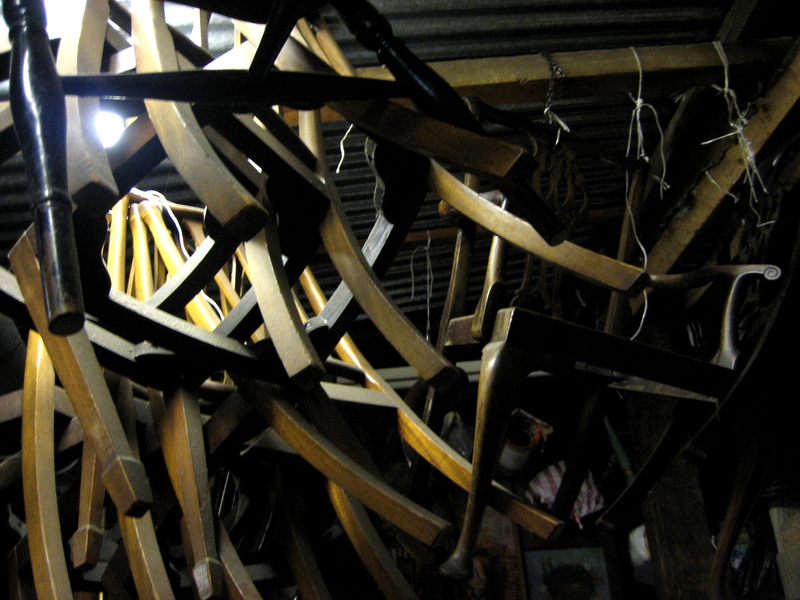 Des led me through the low-ceilinged narrow passage lined with old wardrobes into the shop itself. At first, as you enter a shadowy antechamber, you realise the ceiling is higher and hung with things that give the feeling of being in a deep forest with heavy branches overhead. Then you find yourself in an old stable with a cobbled floor, a corrugated iron roof and spaces opening up on all sides, each crowded with furniture accumulated in the gloom, giving way to indeterminate darkness. This is where Des and Lorraine have dealt in junk for the last thirty years. Without windows, the chill is tangible, and I understood why Lorraine is commonly seen wrapped in a hat and scarf, and whenever possible sits in the car outside during the Winter months. They are busy people, constantly coming and going, collecting and delivering, and it took me several days to get this opportunity to speak to Des when he had a moment, yet even now he was hovering, as customers came and went throughout our conversation. 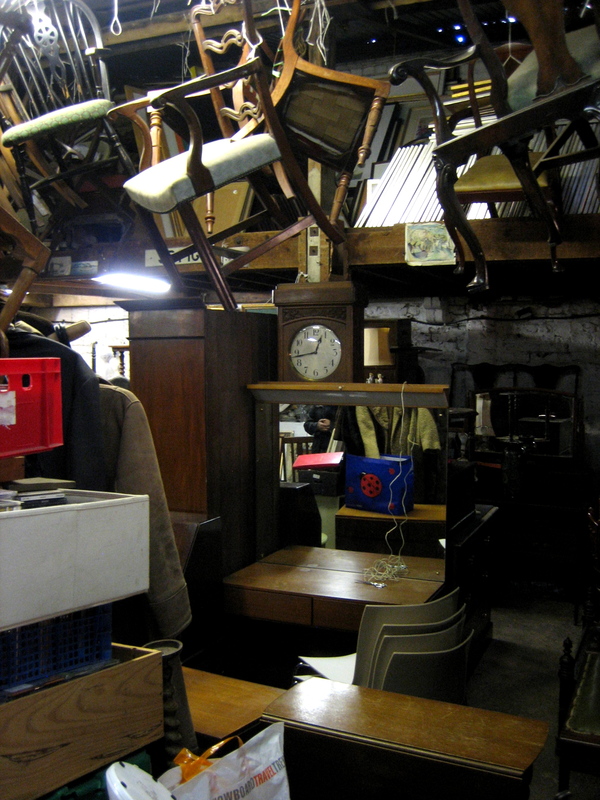 I was touched that Des describes himself as dealing in junk because, while antique dealers consider themselves superior within the hierarchy of professionals, for the inquisitive customer junk possesses the greater romance. With antiques there is an implication of higher monetary value but with junk it is all about the intrinsic poetic quality. So, to my mind, it is greatly to his credit that Des is unapologetically a junk dealer. 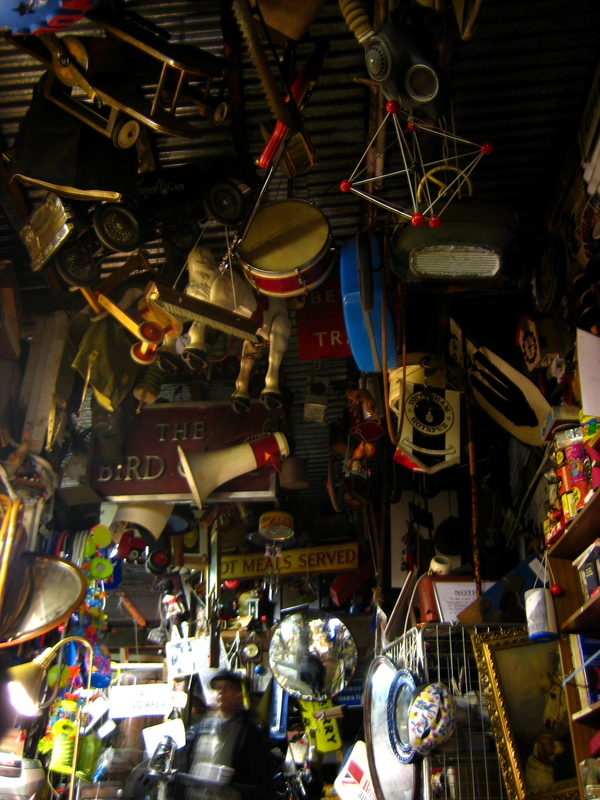 Wherever you look in Des and Lorraine’s magnificent junk shop, the detail is overwhelming and you must be sure to look upwards because there is a panoply of old stuff hung above, creating the impression of an eccentric galaxy of objects in a frozen moment. 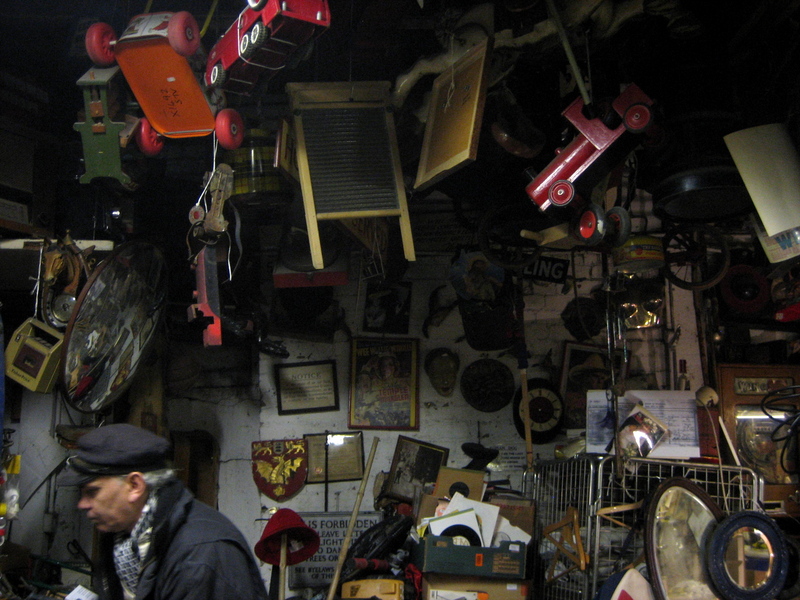 Like his friend Brian in Shadwell who I wrote about last year, Des likes to collect, but where Brian likes effigies and life-size model animals, Des collects old toys and other curios that look good hanging in the roof. The airplanes and vehicles create the sense of motion in Des’ universe, while the other items, like the signs and musical instruments, the gas mask and the giant potato peeler – just visible at the top of the photo above – give it a surreal poetry that is all its own. Gazing up into this thicket is like looking into a dream, yet Des appears to be a down-to-earth fellow. “Certain things I like to keep. Most of this stuff here is from childhood. A lot of people ask to buy these things but they are not for sale. 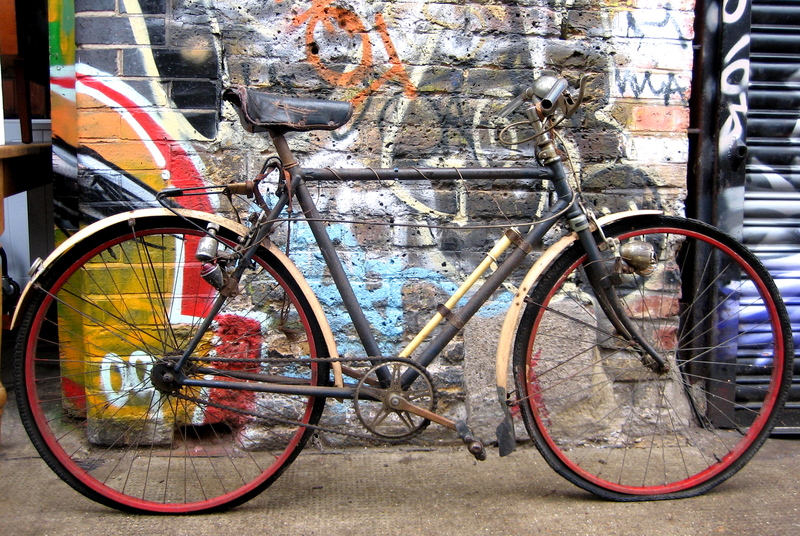 It’s all stuff that’s become collectible. It’s stuff I bought, except the horse which belonged to my kids and they left it out in the rain.” he explained to me, surveying his marvellous collection with proprietorial satisfaction. Willingly consenting to the notion of a mermaid photographed by a mobile phone, I gave Des my number and said goodbye. The picture which you can see below arrived that evening, Des’ mummified mermaid in a glass tank sitting upon his dining table. 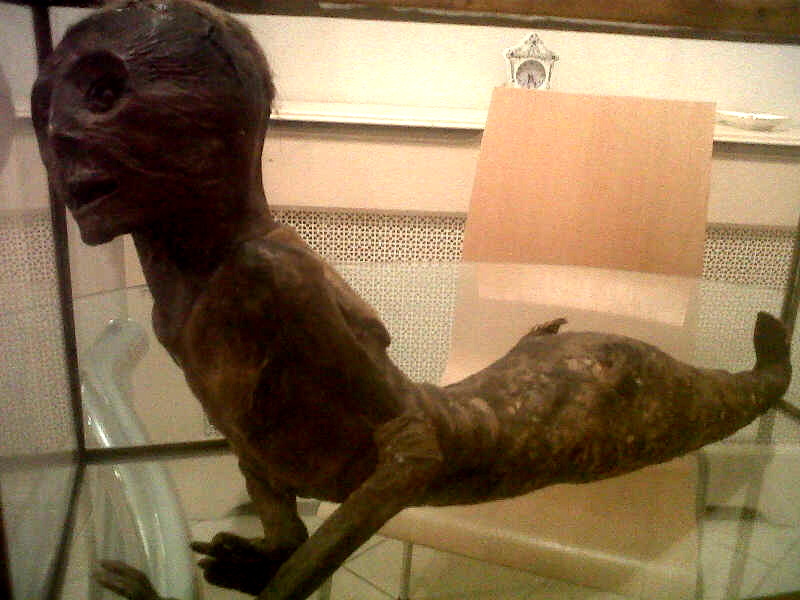 Not wishing to be a killjoy, I shall leave you to draw your own conclusion upon its authenticity as a mermaid, but from this picture I do believe it is an authentic specimen of some kind from a nineteenth century display, a cabinet of curiosities or a freak show, and that itself is good enough for me. Be assured, Des and Lorraine are happy to allow customers to rummage in their shop, as long as they ask permission first. 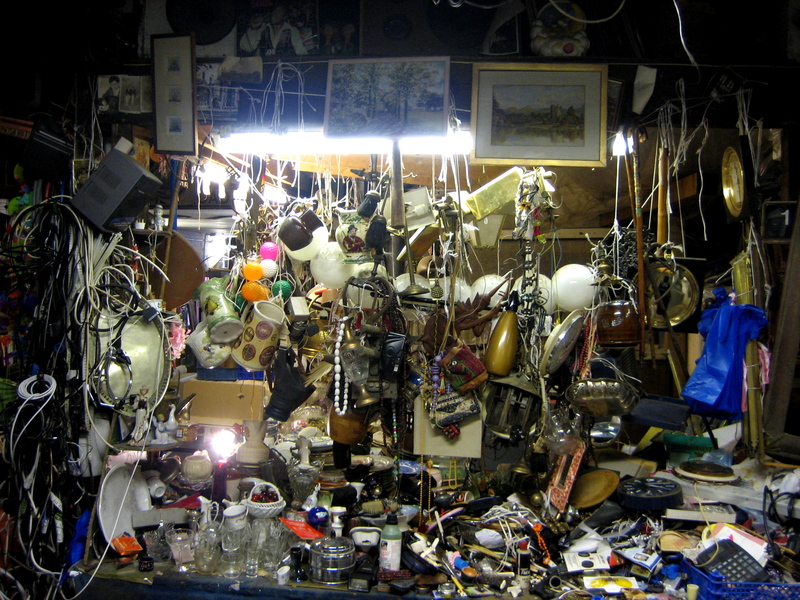 You really need to go round for yourself to this last outpost of the mysterious kingdom of junk, because who knows what you might find there. This sort of “souvenir” was often sold to sailors in far away exotic lands in 18th/19th century. It was made of half mummified monkey and a fish. How weird? It’s amazing that places like this exist. So this is the shop where all our ‘stuff ‘ goes when we no longer want it! I remember being shown the BM “mermaid” in the basement storeroom of the old Museum of Mankind 30 years ago. I’ve never forgotten the shock of revulsion at this pitiful object; I can hardly believe it is now on public display. Goodness knows what the true origin of this one is. My husband and I are coming to London with my daughter for the first time this next summer and can’t wait to check out this wonderfully, curious junk shop! Long ago I read your book and subsequently visited the shop. I chatted to Lorraine about the mermaid. It is a shop “like they used to be” and soon I am about to take a visitor around Spitalfields so will definitely be visiting them again! Last time I was there we had lunch in an equally funky cafe next door ! Sadly, as you may well know, Des is now closing the shop at the end of March 2017 due to an excessive rise in the leasehold. I feel we’re now losing the last remaining quirky shops in the east end of London. I highly recommend that everyone gets down there to see this wonderful emporium before it goes – they are open every day whilst slowly emtying it. Too sad.